The Christmas Menu - A Bountiful With Blessings. Check digital menu boards for restaurants from DSMenu. It's Christmas time again ! Most Americans look forward to this time of the year to have a good time with family and friends. And it’s not just about fulfilling the lists of gift items, but also the filling of bellies as well. This year is expected to be better than earlier years with a stronger economy and lower unemployment rates. Like always, the restaurant fraternity is geared up as well to handle additional footfalls and the logistics and inventory coordinations with their various vendors. Since the season plays an important part in shopping and eating, it is prudent to note that customers would be of four kinds. One, who will eat before or after shopping. Second, those that will eat for sustainance. Third, those that love a great cuisine. And fourth, customers who are regulars and look forward to something special on this day. As such, Christmas celebrations include the two days of Christmas Eve and Christmas Day ( December 24th and 25th ). The Christmas season provides an opportunity for medium and small sized restaurants to enhance their brand image and sales. Restaurants placed in middle income localities can feel the pulse of their trade and market in advance, and hence can innovate on their offerings, based on customer expectations and preferences. Decorations in-store and at the entrance with colored papers, christmas trees, and a member of the staff playing Santa would surely be major attractions. Add-ons in the form of candies, trinkets, baubles and freebees will allure the kids. Approx 50 million people will eat out during Christmas Eve and Christmas Day. 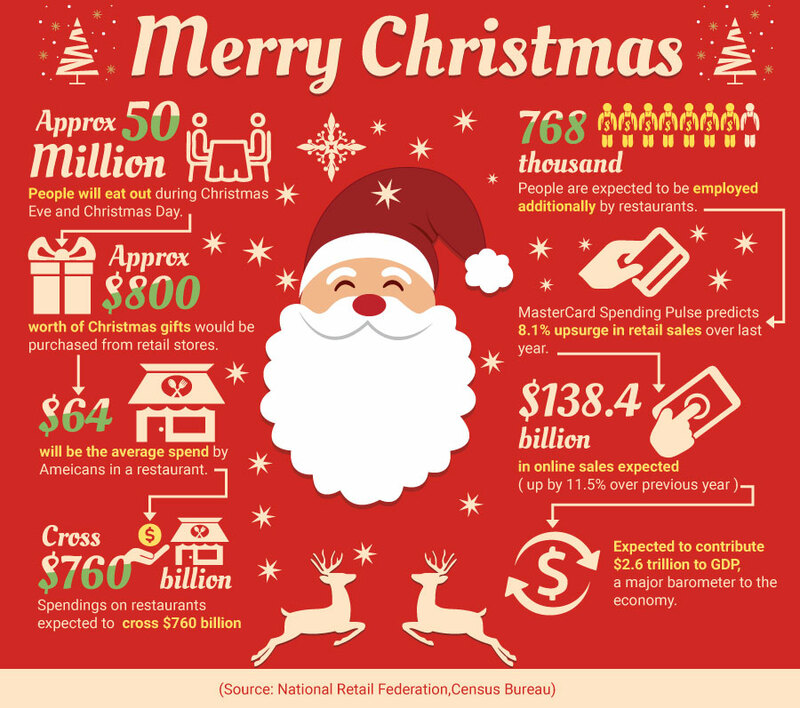 Approx $8oo worth of Christmas gifts would be purchased from retail stores. $64 will be the average spend by Ameicans in a restaurant. Spendings on restaurants expected to cross $760 billion this year. 768 thousand people are expected to be employed additionally by restaurants. MasterCard Spending Pulse predicts 8.1% upsurge in retail sales over last year. Expected to contribute $2.6 trillion to GDP, a major barometer to the economy. Quite obviously, this will be a crucial factor in enticing sales at Point-of-sales locations,specially at the QSR’s. The digital menu board will market both, the menu, and the restaurant brand with it’s design, graphics, images and content. It is recommended that not too many items should comprise the spread. Just the same, there should be enough options on appetizers, entrees, main course and dessert. A few fast food items can also be sold at combo rates during mornings and afternoons. 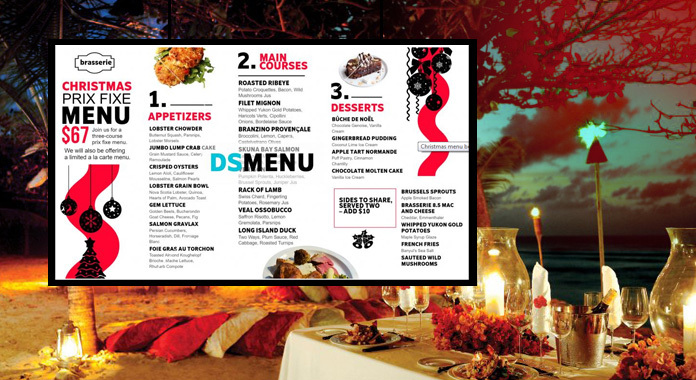 A picture frame menu board would be ideal to present the menu, with each frame highlighting an item of the main course. Graphics and attractive designs in addition make for an alluring menu board. Most experts opine that group casual dining with various price points would be a major hit with families coming in. Example, Xclusive Xmas dinner for four @ $120 only. Similarly, dinner for two with candlelights could be marketed suitably. Choice of liquor should be selected carefully. Premium brands with vintage wines would be ideal. While customers enjoy themselves during Christmas dinners they also maintain sobriety and hence liquor consumption is expected to be more sedate. Helps all. Branding of main course items can be done by giving each item a specific name and promoting its higher quality ( or quantity ) on the menu board. For example, Danny’s Smoked Ribs, Mason’s Saffron chicken, or Sabata’s Steak. Digital signage’s cloud based program enables you to coordinate the menu boards of all your chain stores by a single admin. Hence, if you in Dallas and your other stores are in LA and New York, a single admin ensures all menu updates. Try and run entertaining videos related to your menu. Plan in advance. Devise innovative content.Thus, even if your customers are standing waiting in queue they will be informed and entertained. This will also ensure quick decisions on orders.